To coincide with International Women’s Day 2019, a coding training program for young women designed to improve gender parity in the digital industries, has been developed by Sarenza with Serviceplan France and BECOMTECH. For Sarenza, a French company specialising in the online sale of shoes and accessories, equality between men and women at work is a priority topic: 64% of the company’s employees and 6 of the 10 members of its Management Committee are women. On the occasion of International Women’s Day on March 8th2019, Sarenza decided to illustrate this commitment by highlighting the work of BECOMTECH, a French national association whose ambition is to help young women break into the world of digital and computer programming. BECOMTECH promote gender parity in the profession of digital and computer programming and introduce girls to digital and computer sciences at high school and college. Serviceplan France created an online film which reveals some of the outdated presumptions that coding is not a profession for women, when every man interviewed automatically presumes the codes he is shown were made by a man. 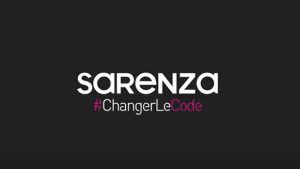 The Sarenza training programme enables girls to learn coding, and paves the way for a new generation of women coders who could potentially change the male-dominated industry in France where only 2% of coders are women.